These are some of the latest #stained glass restoration and repair works the studio has just completed. This Edwardian two panel front door in #Bromsgrove, #Worcestershire has just been re-fitted. A 1930’s stained glass side screen with several breaks needed part restoration and rebuild in #Stourbridge. 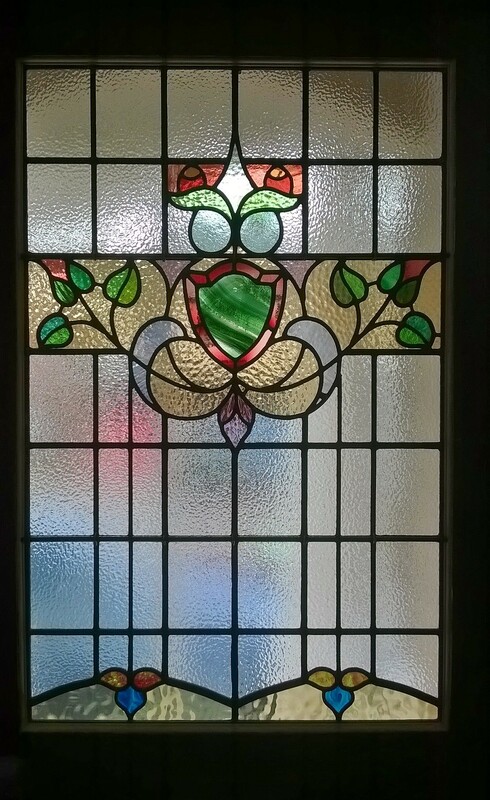 This wonderful #Edwardian stained glass front door entrance in #Wombourne, Staffordshire has been restored using heritage glass and stock art glasses. Our workshop offers a full repair and restoration service of stained glass, leaded lights, doors and windows. We work with residential, commercial and ecclesiastic properties and can repair a single break within a window to a full restoration of heritage stained glass panels. The studio has recently been to survey a series of 1930’s stained glass windows that will need some repairs and restoration over the coming months. The stained glass and leaded panels are in original metal frames, which also need some restoration in areas. The surrounding woodwork frames are in amazing condition and a testimony to the materials used and also the regular maintenance since they were fitted. The stained glass has been designed throughout the house with some amazing patterns, in-keeping with the time, but also has an Arts & Crafts feel to some of the elements. The stained glass contains some beautiful colours and a lot within the patterns are handmade mouthblown colours. It really is a privilege to view these wonderful windows and house. Just before Easter the studio completed a repair and restoration of four fantastic Victorian stained glass bay window panels. There were several breaks within the borders that needed replacing with restoration glass to match and new border leads were needed across the four panels. The stained glass windows were then cleaned and polished to bring them back to their former glory. Such a great feature for the house that is worth all the attention they needed, with some wonderful handmade spun rondels and coloured textured glass. The stained glass windows have now be taken to the glazier for encapsulating into double glazed units and will then be installed into new wooden window frames. The studio recently completed a repair and part restoration of two reclaimed church stained glass windows. The panels are coloured glass diamond patterns, with a red glass border. The glass diamonds have a great random texture to the different tints of colours greens, clears and ambers. Some repairs to the red border glass was needed and the 2 panels have had a new leaded border and reinforcement for strengthening. The studio has been working on designing and making a period Victorian Stained Glass toplight window. Using a traditional Victorian pattern and glass colours, the new window has been made to fit the bespoke size of the aperture above the door and is more in-keeping with the age of the house. The window has now been fitted above the customers front door in Stourbridge. The studio has been working on designing and making an abstract coloured glass window panel. The stained glass panel will eventually be fitted in the transom (toplight) window above the customers door. A number of colour arrangements was tried, working to some set colours and a sample of the clients interior colour scheme. I used different textures to add interest with repeated colours and it will influence movement of light across the whole of the panel. Looking forward to seeing this panel, (once the cement has dried) – up towards the light. The studio recently completed a restoration, which turned out to be a complete re-build of a 1950’s circular stained glass window panel. Really a new window based on a traditional pattern, in-keeping with the property. All of the background clear textured glass has been replaced and the centre diamond (also replaced) is handmade mouthblown amber glass. A simple pattern, with good use of colour and texture. A pattern was made of the existing window which was broken in many of the glass pieces, the glass was then cut to pattern, leaded, soldered at the joints and cemented (putty based) to make stronger and weatherproof. The window has now been fitted back into the window frame of the customers home. On the workbench last week the studio was making an Art Glass panel of abstract design. Art Glass panel all cut to pattern, cleaned and laid out ready for fusing. The customer wanted blues, greens and a touch of warm yellow. Just been to visit with a fellow stained glass colleague from ‘Decorative Glass Restorations’, a Victorian House that is being restored and converted into apartments. The stained glass needs restoring and there are a number of breaks in some of the panels that will need to be replaced with restoration glass to match. Amazing large 22 panel landing window, front door and side door all need bringing back to their former glory. Sarah McDowall has been in the studio taking photographs for a project on ‘Stourbridge Glassmakers’. Sarah is currently studying towards an editorial and advertising photography degree at the University of Gloucestershire. A 1930’s stained glass panel the studio recently restored for a clients front door entrance. Some wonderful use of colours in the original (hand-blown glass shield in the centre) and we were able to match some of the broken panes with heritage & new glass we had in stock. The glass was cleaned and a complete re-leading was needed. The restored panel, with new wooden beading and support bars is now back installed in the customers front door.